How many types of parameter in C sharp? The parameter is used to passing information to a function. Based on the type of parameters, function responses, and returns value. A parameter can be passed to a function by two ways: Passing parameter by value and passing a parameter by reference. 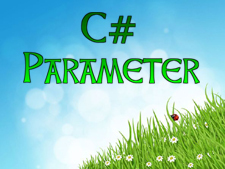 In this chapter, you will learn in details about working with a parameter in C#. In this session, you will learn about different types of parameter in C# such as value type parameter, reference type parameter, output parameter, command line argument etc. At the end of this session you will also do some programming exercises. So, let’s start with Understanding parameter in C#.